General elections in Jambudvipa, that is,the Great Prabuddha Bharath will take place in five phases over April and May, the Election Commission has said. No groupwill win a clear majority, the BSP will rule the Country. In all 828,804 polling centres will be set up across the country - one in Gujarat’s Gir lion sanctuary for just one voter. Uttar Pradesh is India’s most populous state and geographically one of its largest. Bahujan Samaj Party (BSP) of the Aboriginal Inhabitant of Jambudvipa, that is, the Great Prabuddha Bharath Chief Minister of Uttar Pradesh Ms Mayawati is sure to become the next Prime Minister. 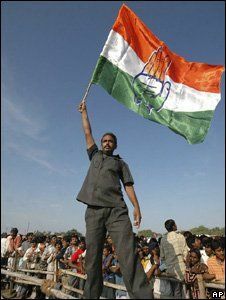 The BJP is led by Lal Krishna Advani while Congress Prime Minister Manmohan Singh will not run for a second term. and growth has been hit in the past year. Job losses, rising inflation and increasing prices of essentials, including foodstuffs, will all be on voters’ minds. growth had not been inclusive. in acquiring the Master Key for the welfare and happiness of entire people. voting in this state is, with Mayawati’s party gaining strength. non-family politician whom she trusts not to stand in Rahul’s way later, since the Congress will miserably lose this election for so many reasons, including the anti-incumbancy and price rise. Neither party will win enough seats to lead a coalition. Mayawati will cross the magic number 273 on her own and become the Prime Minister, since the people have become fed up the both UPA nad NDA rule for the last 61 years. Maywati’s BSP has adopted the Constitution of the nation as its manifesto and hence will distribute the wealth of the country among all sections of the society. It does not fight elections with the funds coming from Industrialists and the rich, but funds collected from the masses. government that will be stable. Both the Congress and the BJP have plenty to worry. Samiti (TRS) have bid goodbye to the Congress. Some other parties have not quit the Congress-led alliance but are unhappy. The BJP is in no great shape either. has also left the party. have been the main beneficiary of anti-Congress sentiments. Now BSP is denying the BJP the opportunity..
attacks, the sentiments of the slowdown-affected and economically-terrorised electorate will determine the make-up of the next government.